I am now nine months into Operation Visit Japan which means I am now past the halfway point and pretty soon I’ll be heading into the home stretch. My constant research into what to do and where to go when I get to Japan continues but with a limited budget I’ll have to cut down that massive 2 page list into something more manageable and affordable ^_^. My up and down battle in school continues, I should be finishing up my diploma this month but alas I failed a couple courses and will have to do some resits. While at work I moved over to the 10th floor of the neighboring office building and have yet to be reconnected to the interwebs at work for now what is the forth week. When I do get reconnected I hope to stream my awesome view via my Ustream channel so look out for a tweet when that happens. $40 dollars in donations via the Chipin widget plus my usual $100 savings from my monthly salary adds $140 to the Operation Visit Japan fund. Add that to the totals from January, February, March, April, May, June, July and August bring the grand total to $1750 or 58% of the $3000 goal! I am now only $60 away from meeting my goal for donations, so if you haven’t donated already please do so soon! Big thanks again to longtime supporters, friends and those who have made donations. 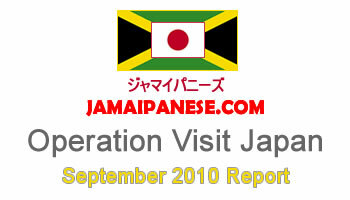 Operation Visit Japan keeps chugging along nicely with my excitement reaching a new level every time I publish one of these posts. THANK YOU! thank you and congrats on passing Japanese Language Proficiency Test Level 4! Great work – won’t be long and you’ll be on your way. I always find it interesting how people decide what to keep in, and what to lose in a first time itinerary. How are you going to decide one way or the other? Then again, you’ve been living with Japan as part of your life for that long, that it’s like you’ve been there many times before. What’s your intended trip length, and what are the must sees? it will be hard to decide what to see what what not to see, done a tonne of research into attractions a project that is still ongoing. I am not too big on generic tourists spots so I am most excited about getting off the beaten track.